A public land or surplus lands policy details the process for making use of Richmond’s public land and would outline a set of public benefits that are prioritized in the development of that land. A strong public lands policy outlines the specific process for the sale or lease of the land, the types of developments that can be made on that land, and additional community benefits tied to the process of development or revenue from sale of the land (such as local hire or ecological impact). A robust community input process and transparent decision-making can help frame what types of community benefits are most important for supporting the broader public good. Finally, the policy would help ensure that the process of selling public lands is a public process that includes members of impacted communities, allowing opportunity for multiple bids and sets a transparent system for judging the applications based on community priorities. California’s Surplus Land Act (SLA) is a state law that directs local agencies, such as a city, county, and districts, to prioritize the development of low-income housing when selling or leasing their surplus land. Surplus land refers to land owned by a local agency which is no longer necessary for that local agency’s use. The land must first be offered for sale or lease to affordable housing developers or for other vital public goods including parks and schools.105 The public agency must prioritize proposals that include at least 25 percent of the units as affordable to lower-income households (at or below 80 percent of area median income). If multiple proposals meet that threshold, the agency must prioritize the proposal that includes the greatest number of affordable units at the deepest levels of affordability. The act also includes an inclusionary housing element if a property is not developed by an affordable housing entity. For example, if the local agency and an affordable housing developer cannot come to an agreement, then the agency may sell/lease the land to a market-rate developer, but 15 percent of the housing units must be affordable to lower-income households. 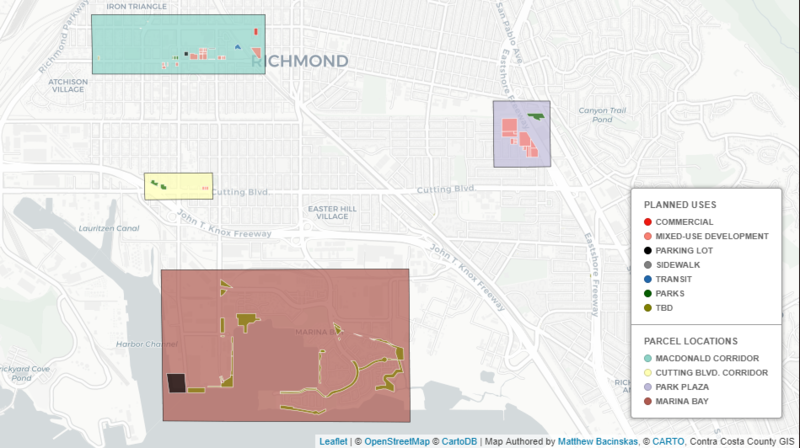 Effects: The City of Richmond owns over two dozen parcels of public land, many of which are in central locations and along or in close proximity to transit routes. The number of units developed on these parcels would be guided by the zoning regulations for the different parcels but would likely be “infill” developments that increase density, thereby reducing greenhouse gas emissions and situating residents in proximity to healthcare, schools, access to food options, and other important services and resources. The percentage of affordable units, and the levels of affordability must meet the SLA baseline of 25 percent for affordable developers or 15 percent for market-rate developers, but could be strengthened in the process of creating the local law. The law could also state where the revenue from the sale of the land is directed, such as an affordable housing fund or related priority identified through a community process, rather than currently reverting to the general fund, 63 percent of which is budgeted for public safety. Limitations: Strictly in terms of dollars, selling public land to a market-rate developer may be the most immediately profitable choice for a local agency. Those in support of that strategy argue that this generates needed revenue for the city. However, donating public land or selling it at below market-rate for the construction of permanent or long-term affordable housing would allow developers to increase the number of units built and the depth of affordability. The use of public lands to address the housing needs of low-income residents advances the overall health and well-being of the city by creating more stable households who then have more money available for other essential resources. The notion of public good here also extends beyond housing. For example, supporting a strong local-hire jobs program alongside the development of affordable housing expands local employment opportunities and circulates dollars in Richmond’s local economy. Raising the baseline percentage of affordable units that trigger a developer’s priority in purchasing/leasing the land. The SLA baseline is currently 25 percent affordable units at 80 percent of AMI. Directing where funds go from the sale/lease of public land (e.g. an affordable housing fund, jobs programs for people impacted by the housing crisis, etc). An impact or linkage fee107 specific to public land developments that is directed to a specific set of community benefit programs such as housing, jobs, education, or other priorities defined through a community process. Increasing the inclusionary housing percentage and depth of affordability for land sold/leased to market-rate developers from the SLA level of 15 percent affordable units at 80 percent of AMI). The development of additional guidelines defined by a community process that would influence the consideration of developer proposals, such as the inclusion of family units, housing for seniors, disabled people or the formerly incarcerated would help a proposal rate more favorably than proposals that do not have a targeted approach. In the event that revenue generated from the sale of public lands can be directed to an affordable housing fund, it is important to consider if it creates broader community benefit to couple these proceeds with other available subsidies to support 100 percent affordable developments (at or below 60 percent of AMI) at another location, or to pursue on-site developments that only have to meet a lower threshold of affordability, or have to include more market-rate units in order to address other costs (such as the cleaning of toxic soil). This should be weighed against the locations of public land and their access to resources and services, and the possibility of negotiating of deep affordable developments on-site through decreasing the cost of the land at sale. The Richmond community has already explored a robust set of community benefit agreements when considering the development of the Berkeley Global Campus. This process could be an outline for exploring how the development of public lands could address greater community benefit. Advocates will need to address conflict that may arise from potentially competing interests. For example, affordable housing providers may contend that paying construction workers and on-site staff a living wage constricts their ability to maximize affordability. Looking for additional funding sources for this, such as a county housing bond, may prove useful. A public lands policy could be passed via the city council or at the ballot. The complexity of this policy requires a collaborative community process that involves multiple stakeholders including city residents, city staff responsible for implementing the policy, affordable housing developers, tenant, employment, and environmental organizations, and independent legal advocates. In 2015, San Francisco amended their Surplus City Property ordinance to prioritize the use of public lands for housing, services, and other programs for homeless people. Coming out of the City of Oakland’s attempt to sell a public parcel to a market-rate developer in 2015, a coalition of advocates and city staff have been meeting to develop a local public land policy that will go to council in early 2018. The initial attempt to develop the land by a luxury developer was halted by the organizing efforts of the East 12th Street coalition (http://proposal.e12thoakland.org/). There is no legal precedent regarding the implementation of the state law, however a case is currently in an appeals court in San Jose around the city’s sale of public lands to luxury developers and the applicability of the state law to charter cities (like Richmond and San Jose). 107. An impact or linkage fee is a fee charged on all new developments to offset the “impact” of that development on the city and is charged on a per square foot basis of the new development. 109. Map authored by Matthew Bacinskas, data from City of Richmond Long Range Property Management Plan and Contra Costa County Mapping Information Center, 2017. 110. Map authored by Matthew Bacinskas, data from City of Richmond Long Range Property Management Plan and Contra Costa County Mapping Information Center, 2017.